Heating interlayer, the material is SUS304 sheet both inside and outside. The thickness of inside sheet is 2.5mm while the outside is 1.5mm. Also keep constant temperature. 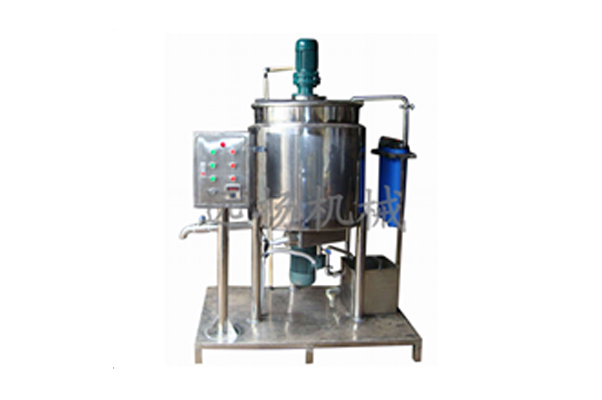 Can heating by water or oil, providing the function of mixing, emulsifying and three-level water treatment. With high efficiency, 300kg products can be made every half hour. It's the first choice of small and medium production of shampoo, body lotion, Auto water wax, Table board liquid, hair conditioner, Leather conditioner, leather polish and so on. Tap or well water can be used directly. The pipeline high shear dispersing emulsifying is a high-performance equipment. It can make the material processing continuously and circularly. There are three series of stator of rotor which are dual and multi-bite in the narrow reactor. The motor-driven rotor revolves at a high speed that generates a strong axial suction, the materials will be sucted into emulsification pump,the materials are scattered sheared and emulsified in the shortest time. As a result, the distribution rang of particle radius will be markedly narrowed that make the product produced finer and long-term stability.